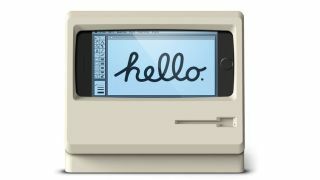 Your iPhone can now look like the classic Mac while it charges. San Diego-based case manufacturer Elago have released the M4 phone stand, a follow-up to their successful retro-themed Apple Watch stand the W3. We seem to be undergoing a wave of tech nostalgia at the moment, with the NES Mini taking the gaming world by storm, the PS4 getting a retro mod case so it can look like the original PlayStation, and of course the comeback of the Nokia 3310. Elago’s second foray into the world of retro tech was probably inevitable given the success of the W3. That success was built on a solid trifecta: the W3 was cool, functional, and cheap. Designed with space inside the body of the ‘Mac’ for a wireless charger, you could easily slip your Watch into the W3, and it would charge while sitting at an angle where you could still see the screen. Plus it actually looked like a little Mac, with the square screen of the Watch perfectly replicating the Mac screen. At $12.99 (about £10 UK, $17 AU) on Amazon that’s a perfect addition to your desktop. The M4 is a little different. While you can still charge your phone, the charging port is at the bottom of the iPhone, meaning the Lightning Cable sticks out the side of the ‘screen’. What’s more, the iPhone’s dimensions mean the Mac doesn’t really look like a Mac. The colors and design are right, but the body looks unnaturally stretched out sideways. At $34.99 (about £27 UK, $46 AU) on Amazon, it’s more than double the price of its predecessor, and it doesn't come with any actual charging accessories. So it's probably not the cheapest or best phone stand out there at the moment, but if you're currently riding the wave of all things retro maybe the M4 is for you. It comes in both white and black, and is capable of housing the iPhone 6, 6 Plus, and 7, reports The Verge.